Day 1: Arrival Kanobe International Airport – Transfer to Akagera National Park. Day 2: Game drive / Transfer back to Kigali. Luxury – Serena Kigali Hotel. In the morning after breakfast, go visit the genocide memorial and national museum and then drive to proceed to Volcanoes National Park near Lake Kivu and Musanze town. Check into your hotel and relax. Option afternoon activities are available. Day 4: Rwanda Gorilla Safaris. Have an early breakfast at around 6:30am and then drive to transfer to the park headquarters for briefing. After briefing you will transfer to the starting point to start your search for the gorillas. Once you meet the gorillas, you will be allowed to spend 1 hour following them and then later return to the starting point. The feeling of meeting the gorillas for the first time is un explainable, but worth the struggle . Day 5: Transfer back to Kigali. At around 8am after breakfast, you will drive to head back to Kigali. 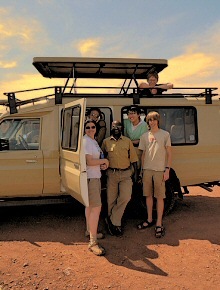 End of Rwanda Safari.